The North American Standard N° 1 / 01. 01. 2012. Section 1.2 Continental pointing dog, spaniel type, with working trial. The breed developed from pointing dogs originating in Spain (Spioenen) and arrived in The Netherlands via France in the 16th Century. In The Netherlands, these dogs were referred to as Partridge dogs. In the eastern parts of the country, principally in the Province of Drenthe, these Partridge dogs were bred among themselves and not mixed with foreign breeds, as occurred elsewhere. Throughout history, the breed has stood upon three equally important pillars; a versatile hunting dog: able to hunt all upland game and water fowl, a farm yard dog: announcing visitors to the home or farm (without showing aggression or fear), and a playmate to the children: having excellent qualities as a valued family companion. These attributes are innate and fundamental to the Drent, and the three pillars of hunting, farm and family dog, continue to serve as guiding parameters as to what define what a Drent is today. The breed was recognized by the Dutch Kennel Club on May 15, 1943. Since his North American introduction, the Drent has proven to be an excellent choice as the dogs are able to switch gears quickly. This is helpful when a day of hunting may include birds from the sage grouse to chukars and terrain as varied as high-desert sagebrush to aspen thickets. Best of all, the dogs enjoy it all. He has the adaptability needed to hunt all manner of upland game and waterfowl. After the shot, he retrieves from land and water and has a reputation as a determined and efficient finder of lost game. A well proportioned dog, lean muscled and with clearly delineated markings, reflecting physical strength and the ability to generate sufficient speed for a hunting dog. He has a wedge-shaped muzzle, slightly shorter than the skull, and rather dry lips without significant flew. He is slightly longer than his height at the withers, making him slightly elongated. The coat is short to medium-long on the body, but gives the impression of a longer haired dog through feathering on the legs, well haired ears, a richly haired throat and chest, and bushy, long hair around the tail. He is the hunting dog “par excellence” for hunting a variety of terrain and game. The dog hunts under the gun. Keeping in touch with the hunter is apparently an innate desire. Many dogs, upon scenting game, move the tail in a circular motion. When the dog points, he remains motionless, awaiting the approaching hunter. If this takes a long time, the dog will often look back at his hunting partner. His adaptability makes him suitable for all manner of game in the field as well as water fowl. Moreover, his work after the shot is exceptional, and he is a good retriever. These characteristics are innate, and the dog therefore needs little field training. Due to the dog's soft nature forceful training methods are inappropriate. The dog is expected to bark to announce visitors to the home, and is often reserved towards strangers until the owner welcomes them. The dog is loyal and intelligent and, with proper upbringing and training, a pet of exceptional value on top of being a good hunting buddy. Skull: The skull is rather wide and only slightly domed. A barely perceptible groove runs from the shallow stop to halfway up the moderately developed occipital bone. Stop: The transition from the skull to the muzzle is, from the side as well as from the front, gradual: the cheeks transition smoothly into the muzzle. The superciliary arches are sufficiently developed to be clearly noticeable. Muzzle: The muzzle is wedge-shaped, slightly shorter than the skull and blunt, with a smooth line from the eyes to the nose without a depression below the eyes. The top line is flat, neither hollow nor bowed. A very slight upward curve of the muzzle behind the nose is permitted. A ram's nose is a serious fault. (Ram’s nose also known as a “roman nose” or slightly arching nose). Lips: Rather thin and tight. Jaws / teeth: Dentition is powerful with a proper scissors bite. Eyes: Widely separated and set in such a way to be well protected: neither protruding nor deep-set, of medium size and oval shaped. The expression is good-natured with the intelligence of a hunting dog. The desired color is amber; neither dark nor the light color of a bird of prey. Ears: Not heavy. Set high and carried along the side of the head without a fold. When pulled snugly along the jaw, the ear should end three fingers' breadth from the nose. They are broad at the onset and end in a rounded point. The outside of the top of the ear is well appointed with preferably tightly wavy hair, not curly. The bottom of the ear is covered with shorter hair, but the edge of the inner upper inner ear is also feathered. When the dog's attention is drawn, the ears are pulled up and turn forward. Seen from the front, the ears form a triangle with a fold in the middle of the ear. The ear is mobile and part of the expression of the dog's mood. NECK: A powerful neck of medium length, but rather short than long, smoothly transitioning the head to the body without interrupting the line of the body. Exceeding the desired length, creating an impression of elegance at the price of strength is undesirable. Dewlaps and throat folds take away from the impression of a leanly muscled, clean-cut dog and are therefore not desirable. Top line: The line transitions from a moderately long neck smoothly to a straight back and loins and ends in a slightly sloping croup. Back: Powerful, of medium length, not too short. The back gives the impression, with properly angulated front and rear quarters of a slightly elongated dog. Croup: Broad and long, slightly sloping. Chest: Deep, reaching to the elbows and, when seen from the front, wide. The first ribs should not be bent such that the movement of the front legs is hindered. A narrow, shallow ribcage is a serious fault. The ribcage is long. The rear ribs are therefore also well developed. Well sprung, not flat nor barrel shaped. Underline: The abdomen is slightly tucked-up. TAIL: Rather high set. The bone of the tail reaches almost to the hocks. The first half is carried downward, and then turns slightly up. When working the tail is partially stretched, with the end slightly curved upwards. Never carried curled above the back. With the exception of the root, the tail is richly haired all around, decreasing in length towards the tip. Shoulders and upper arms: Long shoulder blades, sloping and well laid back. Upper arms slope backwards to create a proper angle with the shoulder blade. As seen from the front and side the shoulder and upper arms enclose and are proportional with the front chest. Elbows: The elbows are held close to the chest, neither turned away from the body, nor inwards in a way that would limit the dog's movement. Wrist (carpus): Strong with good bone. Pastern (metacarpus): Straight, neither turned in nor out, with a slight spring. Forefeet: Round to oval, with tight, arched, strong toes and well padded. Hindquarters: Well developed, thus broad and strongly muscled. Upper and lower thigh: The pelvis, thigh and shin bones are properly angled. The rear legs, as seen from behind, are neither too narrow, nor too spread and are completely vertical. That is, the tarsus' neither turns in nor out. Hocks: Hocks are low to the ground, and the pasterns (metatarsus) are therefore short. GAIT: Long striding, harmonious and driving from the rear, neither narrow nor wide tracking at a trot; without swinging and turning out of elbows or hocks; tending to converge to a single line. COAT: A dense, well covering, non-curling coat; not long-haired, but gives that impression because of longer hair on several parts of the body. The throat and fore-chest have longer hair: the ears are covered with long, preferably tightly wavy hair. On the back, up to the tail longer, wavy hair flat to the body is appreciated. The tail is, other than the root, thickly covered with hair around, the length of which tapers off towards the tip. The feet are well haired between the toes. Coats which have a full curl are considered “open” and are not desirable and can be considered a fault depending upon the extent of coverage. COLOR: Color may range from a rich dark mahogany brown, shades of milk-chocolate, to lighter shades of brown, which can nearly appear reddish orange. Markings: White with brown plates, with or without small spots “spikkels”. Mixtures of brown and white hairs, also called “schimmel”, with or without plates, similar to the Kleine/Grote Münsterländer or German Shorthair/Longhair Pointer are not allowed. Mantel dogs (dogs with a large brown plate covering greater than fifty percent of the dogs’ body) are less desirable. Ideally, the color white should be greater than fifty percent of the dogs’ coat. Areas of white fur are to be a field of white and areas of brown fur are to be brown without schimmel. 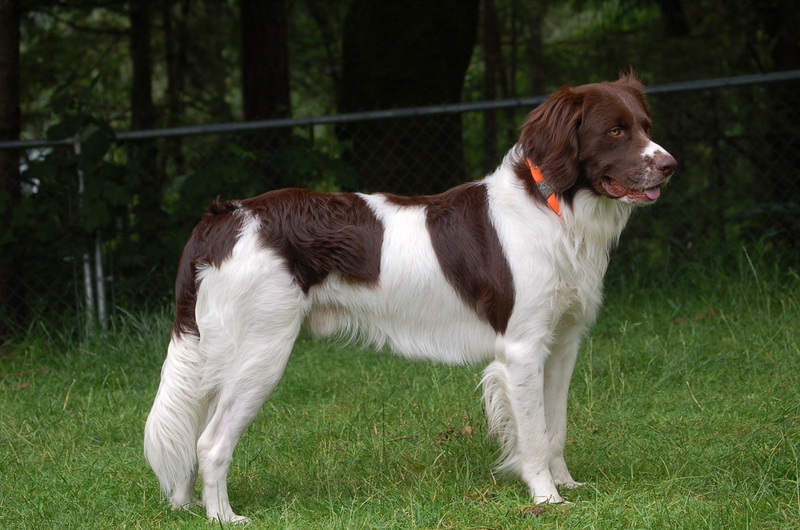 Solid brown heads are allowed, as well as white blazes, and noses surrounded by white fur. The ears are brown, as is the hair around the eyes. Also the root of the tail where it joins the dog’s rump must be brown. Height at the withers: Males: 23-25 inches. Females: 21.5 – 23.5 inches. Exceeding the maximum height up to an inch is acceptable if in proportion to the dog's build. Faults: Each deviation from the standard must be noted as a fault, and the seriousness of the fault in the evaluation must be held in proportion to the extent to which the fault is present. Disqualification: Males must have two apparently normal testicles, naturally descended into the scrotum.